The Ganmill Range is designed to hold the pad closely against the body ensuring optimum performance of the pad. The product structure guarantees optimal anti leakage security, allowing more freedom for movement while also minimising the risk of skin irritation. 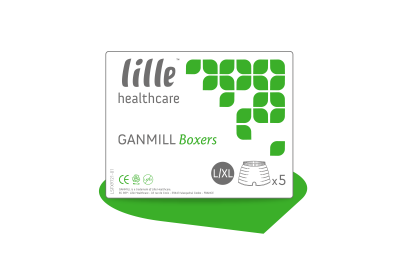 Soft, discrete and comfortable, the Ganmill Boxers are just like regular underwear. Designed to securely hold Suprem Light, Suprem for Men pads or Classic Pad rectangular pads and/or Suprem Form large-shaped pads they are very extensible to adapt to all body shapes.